Professor Bill Stirling, Director of the Institut Laue-Langevin (ILL), made a two-day visit to ESS. He was briefed on the progress of the project and held meetings to discuss where the two facilities are cooperating and to explore where they can do more together in the future. Above (l-r): ESS Director General Jim Yeck, Skanska Section Manager for Tunnel Works Kieran Deasy, ESS Deputy Project Manager Magnus Jacobsson, and Director of the ILL Prof. Bill Stirling, at the ESS construction site. LUND — The director of the world’s leading centre for neutron science made a productive two-day visit to the site of the next world-leading neutron source, The European Spallation Source (ESS). ILL Director, Professor Bill Stirling, met January 27-28 with ESS Director General and CEO Jim Yeck to discuss the latest progress at ESS as well as recent developments at ILL in Grenoble, France. Through a series of meetings that spanned the full range of the ESS project and its team members, as well as a visit to the ESS construction site and a tour of Max IV, Stirling received an overview of the developments in Lund. 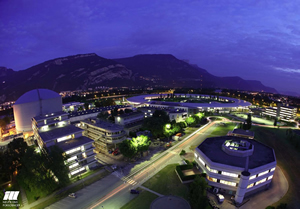 The Institut-Laue Langevin in Grenoble, France. As part of his visit, Stirling gave a presentation to ESS management and other personnel describing ILL in the context of its partnerships with the European Photon and Neutron (EPN) science campus and the GIANT innovation campus, which together form a large physical and organisational conglomeration of science and industry concerns based in Grenoble. Sterling also gave a round summary of major recent activities and the current status of the ILL. Further meetings took place between Stirling and several members of the ESS science management team, as well as group leaders from those project areas where ESS and ILL anticipate opportunities to work together. The enormous benefits of the ESS-ILL collaboration have already been witnessed in the two institutions’ ongoing five-year cooperation in the context of the 7th Framework Programme focused on developing a new generation of advanced detector technologies. The MultiGrid detector prototype, based on ILL’s detector concepts and fitted with the boron carbide-coated aluminium plates developed by ESS and Linköping University, is widely seen as the way forward for detector technology in the wake of an uncertain market for the industry-standard Helium-3. Established over 40 years ago, ILL is a major partner of ESS and has long been the world’s flagship institution for research with neutrons. With more than 800 experiments conducted each year, on some 40 instruments, the facility has laid the neutron science foundation that ESS will build on. ESS, established as a broad consortium of European nations, will be the world’s most powerful neutron source when it goes online in 2020. 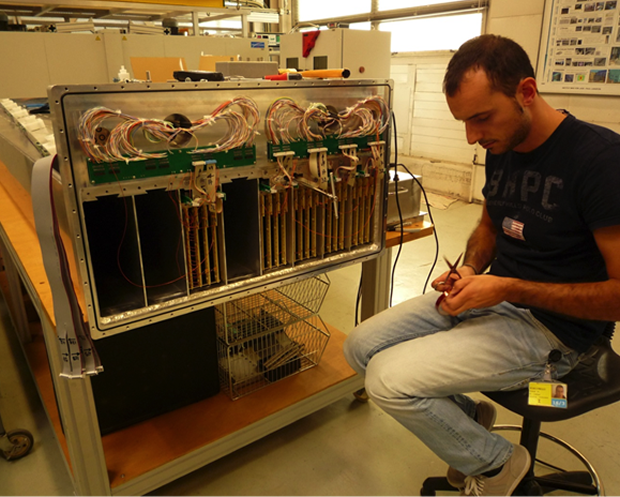 In addition to the collaboration on detector technologies, key ESS personnel have come from ILL and some important ESS instrument design and engineering will also take place at the facility. Prof. Stirling, who is also the former director general of the European Synchrotron Radiation Facility (ESRF), has himself designed and built instruments, some of which are still in use today.